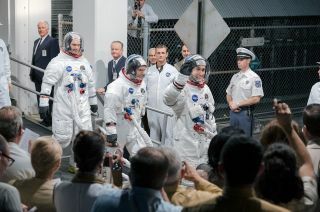 The Apollo 11 crew launch walkout scene from the movie "First Man" includes multiple cameos and easter eggs. "First Man" is a movie steeped in even more space history than audiences might be aware. The new movie from director Damien Chazelle starring Ryan Gosling as Neil Armstrong, the first man to walk on the moon, is rich in visual and thematic nods to NASA's real history, from the detailed recreations of spacecraft and spacesuits to the use of the actual space-to-ground transcripts that informed the screenplay by Josh Singer. But in addition to ensuring an overall authenticity for the big set pieces and scenes, Chazelle and his fellow filmmakers also inserted some much more subtle references to the history they were depicting. "First Man" is flush with these hidden details, or "easter eggs," that maybe only eagle-eyed space geeks might notice. For everyone else, here are some of the "small steps" that Chazelle and crew took to infuse "First Man" with even more space history. Spoiler warning: This article references both minor and major details from "First Man." If you have yet to see the movie, you may want to read it after doing so. Astronaut Charlie Duke is seen as capsule communicator (CapCom) during the Apollo 11 mission in July 1969. "Roger, Twan— Tranquility, we copy you on the ground. You got a bunch of guys about to turn blue. We're breathing again. Thanks a lot." If that line (complete with the initial stumble over the pronunciation of "Tranquility") from "First Man" sounds familiar, it is because it is the exact words radioed to the real Armstrong and Buzz Aldrin after they landed on the moon on July 20, 1969. In fact, it should sound more than just familiar. "First Man" has actors portraying a number of Armstrong's fellow astronauts, including some who served in Mission Control as the capsule communicator, the crew's point of contact with the ground. But for those they did not cast, including Bill Anders and Bruce McCandless, the filmmakers decided to use the astronauts' real voices from archival audio instead. So that is the actual Charlie Duke, who served as "CapCom" during the Apollo 11 lunar landing, that audiences hear when Mission Control radios, "We copy you down, Eagle." Realizing they needed to explain to moviegoers what was about to transpire on screen — explanations that were absent from the Apollo 11 record — the filmmakers had Duke record a few lines, resuming his role as capcom almost 50 years after the mission. So the Mission Control that audiences hear during the "First Man" moon landing is consistently Duke, only sometimes his voice is separated by half a century. Neil Armstrong's sons Rick and Mark, as well Mark's son Andrew, have cameos in Gemini Mission Control in "First Man." Duke's voice is not the only cameo in "First Man." The movie is peppered with faces from the space history community — especially in its depiction of Gemini Mission Control. When Armstrong (Gosling) and Dave Scott (Christopher Abbott) come back into radio contact after their Gemini 8 spacecraft spins out of control, NASA's director of flight crew operations Deke Slayton (Kyle Chandler) orders Paul Haney, the "Voice of Mission Control," to cut off the "squawk boxes" that fed mission audio into the astronauts' homes. Haney is portrayed (and voiced over the box) by Mark Armstrong, Neil's son. Rick Armstrong, Mark's brother, is also in Mission Control, seated to Mark's right. Andrew Armstrong, Mark's son, also makes a cameo as the flight controller who is playing guitar after Gemini 8 achieves the world's first docking in space. The cameos, though, do not end in Mission Control. At the White House reception, Chazelle's parents are among the guests and his sister, Anna, is the staffer who lets Armstrong know that Slayton is on the phone. At the Cape, as the Apollo 11 crew is having their pre-launch breakfast, an artist is shown sketching Armstrong. In real life, the late Paul Calle was there to sketch both the breakfast and the astronauts' suiting up as part of NASA's art program. In "First Man," Chris Calle, Paul's son and an accomplished space artist in his own right, portrays his father. And as Armstrong (Gosling), Aldrin (Corey Stoll) and Michael Collins (Lukas Haas) exit crew quarters to board a van for the launch pad, the three walk down a ramp and pass by a suited gentleman. That onlooker is Kurt Debus, the first director of Kennedy Space Center, as portrayed in "First Man" by historian James Hansen, author of Neil Armstrong's authorized biography, which was the basis for the film. In that same scene, Bonnie Baer, daughter of Gemini 4 and Apollo 1 astronaut Ed White, also makes a cameo appearance. As Collins (Haas) walks past Debus (Hansen), he is seen carrying a brown paper bag, reproducing a subtle detail from Apollo 11 history. It was a tradition for the astronauts to bring to the launch pad gag gifts for Pad Leader Guenter Wendt (portrayed by Steve Coulter in "First Man"), who oversaw the crew being strapped into the spacecraft and the final preparations for launch. Armstrong gifted Wendt a coupon for a free ride "between any planet, moon, star or galaxy in the solar system," Aldrin presented a copy of "Good News for Modern Man," a condensed version of the Bible, and Collins pulled out of a brown paper bag a fish mounted to a wooden plaque. "'At your house, I've never seen a big trophy trout or trophy fish on your wall. You need one,' Collins said, as recalled by Wendt in a 1999 NASA interview. But there were a few things with Collins' fish, hence the gag. It was too small to have been legally caught, it was not cleaned and it was not preserved. In preparing to portray Collins in "First Man," Haas learned about the trophy fish and realized there was something missing when it came time to film. "When we were on our way out, walking down the ramp, I didn't have the bag," recalled Haas in an interview with collectSPACE.com. "And the prop people were like, 'What? No one told us about this.' And I'm like, 'Well, if you read Collins' book or look at the [July 16, 1969] picture, you can see he's got a brown paper bag.' So they rushed off and found a brown paper bag." "I felt proud of the fact that I remembered he needed his fish," said Haas. The brown bag adds one more authentic detail to a scene that was already more than a mere recreation. The building that Haas, Gosling and Stoll exit and the rampway that they descend are not on a movie set, but were filmed on location at the Kennedy Space Center in Florida. Read about 10 more space history easter eggs in "First Man" at collectSPACE.